We're all supposed to be Keynesians now, so we should understand that government spending creates short-term economic stimulus, which is one reason the Bush-era bubble took so long to burst. But not all government spending is created equal. Obama needs to pump serious cash into the economy in a way that promotes his long-term priorities. That means billions for energy-efficient and climate-friendly infrastructure like wind turbines, solar panels and mass transit, but nothing for new sprawl roads that ravage nature and promote gas-guzzling. That means stronger levees and restored wetlands that will help protect New Orleans from the next storm, but no more traditional pork-barrel water projects that destroy wetlands and waste money. Mostly, it means revamping Washington's dysfunctional method of selecting and funding infrastructure projects. 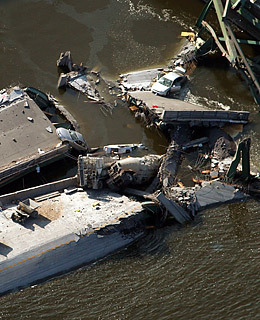 America's infrastructure is broken, with more than 150,000 structurally deficient bridges, 3,500 unsafe dams and antiquated sewer systems that need an estimated $400 billion worth of improvements. That's a big long-term problem for America's economic competitiveness. But the Federal Government's two basic approaches to infrastructure are broken too. The most notorious is known as "earmarking," the stashing of pet projects into larger bills by members of Congress, and while Obama was correct to remind John McCain that earmarks are only 1% of the budget, they're a lousy way to decide what gets built. An example: the $23 billion water-resources bill crammed with 900 projects for the already overloaded Army Corps of Engineers. These projects won't be funded according to need, cost-effectiveness or relation to national priorities; they'll be funded according to congressional clout. The same goes for the 6,300 earmarks  including Alaska's "bridge to nowhere"  stuffed into the $286 billion transportation bill. Profligate as that sounds, earmarks made up less than 10% of the bill's cost. The rest of the cash went to state transportation agencies to spend as they pleased  often on their own roads to nowhere, which is why the bill is usually called the "highway bill" in Washington. Most states consistently favor roads over mass transit, building new roads over repairing old ones and building those new roads in rural rather than metropolitan areas. That means more sprawl, more traffic, more smog, more foreign oil and more carbon emissions, but the feds don't seem to care. In fact, the current archaic federal rules encourage all these biases; strict cost-benefit analyses are required for transit projects, but for highway projects, you can pretty much just roll out the asphalt. To jump-start the economy, Obama needs to spread around hundreds of billions of dollars, and he'd be wise to start with the currently underfunded efforts to restore the Everglades, coastal Louisiana and the Great Lakes; to repair crumbling dams, dikes, sewer pipes and bridges; to promote high-speed rail, light rail and other transit systems besieged by skyrocketing demand; even to accelerate research into renewable energy and alternative fuels. But first he should repeal the old water and highway bills  two of the most popular pieces of legislation on pork-obsessed Capitol Hill  and demand a new approach. He can call it a New New Deal or a Green New Deal, but it needs to be a deal, not just a spending spree. How it would work is simple: the feds would supply cash but only to promote federal priorities. So funding decisions would be made by technocrats rather than congressional ribbon-cutters  like similarly hyperpolitical military-base-closing decisions  and strings would be attached. To his credit, Obama has proposed a "national infrastructure bank" designed to depoliticize these decisions, but he has also proposed a $25 billion bailout for fiscally strapped states, which sounds like more of the same. In the Clinton era, welfare reformers successfully argued that federal aid is not a right and that recipients have responsibilities. Now the Bush era is ending with gigantic few-strings-attached handouts to banks and talk of new bailouts for automakers who won't even be required to increase fuel efficiency. Obama needs to make it clear that while Big Government might be necessary right now, the era of Big Government that doesn't insist on intelligent returns on its investment is over.